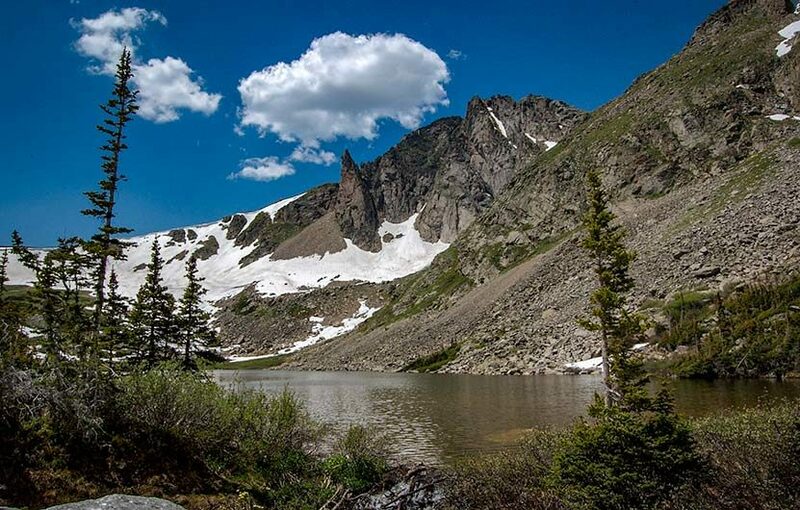 Devils Thumb Lake is located in Indian Peaks Wilderness north of Boulder Colorado and can be accessed via a 6.5-mile (one-way) steep and challenging hike. 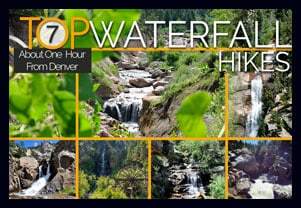 Wildflowers, alpine meadows, small waterfalls, and cascades all beckon those who have the stamina to explore these heights in the Front Range near Denver. Explore the full Devils Thumb Lake hike profile below for trail map, driving directions, and more tips and details to help you enjoy this adventure in the Indian Peaks Wilderness. The parking at Hessie Trailhead is limited, so be sure to take some time to review these details before departing for your hike. Boulder County offers a shuttle that runs from Nederland every 15-20 minutes on weekends during the Summer months and on some holidays. For full details on the Hessie Trailhead Shuttle, please see the Boulder County page for the shuttle service. This shuttle departs from the RTD Park-n-Ride in Nederland. At the roundabout in Nederland, Colorado, drive south onto CO-119/South Bridge St. Take a right onto Eldora Road which will take you to Elodora Colorado. The road continues through Eldora, and changes to Eldorado Road. It proceeds out of town and changes its name to Hessie Road. About 3/4 of a mile outside of Eldora, the road will split, 4th of July Road goes to the right, and Hessie will turn to the left. The 2WD Hessie Trailhead Parking area is at this split. Do not park alongside the road, as you will likely be fined. If the parking area is full, then go back to Nederland for the shuttle (weekends and holidays). There is parking for 4WD vehicles further up the dirt road and closer to the beginning of the official trail. It’s important to know that rains can quickly flood this segment of Hessie Road. Most hikers will begin the hike up to Devils Thumb lake at the Hessie 2WD parking area. From here, pick up the trail that runs along the north side of the 4WD dirt road. The trail will run alongside a small pond, keeping to the right-side of the 4WD segment of Hessie Trailhead road until it arrives at the official trailhead. Moose frequent the wetlands on this segment of the trail, so be alert–you may get a chance to snap some photos of them. At approximately 1/2 mile from the shuttle drop, a sign marks the site of the old mining town of Hessie, Colorado. A bit further up, the trail will cross a footbridge over Middle Boulder Creek. Soon after the bridge, you’ll find the official trailhead signage that provides a quick-reference map. Because this is a longer hike into demanding terrain, we recommend Trails Illustrated: Indian Peaks Wilderness map for this hike. After crossing the bridge near the trailhead, the trail climbs the mountainside via an old mining road. 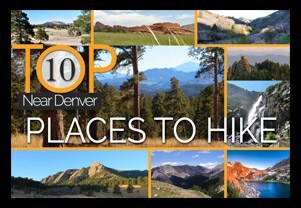 After 1/4 mile, the forest gives way to a meadow and opens up to views breathtaking views of Rocky Mountain scenery. At the first intersection, both trails will lead to Devil’s Thumb, and both options are approximately the same length. So, which one is best? 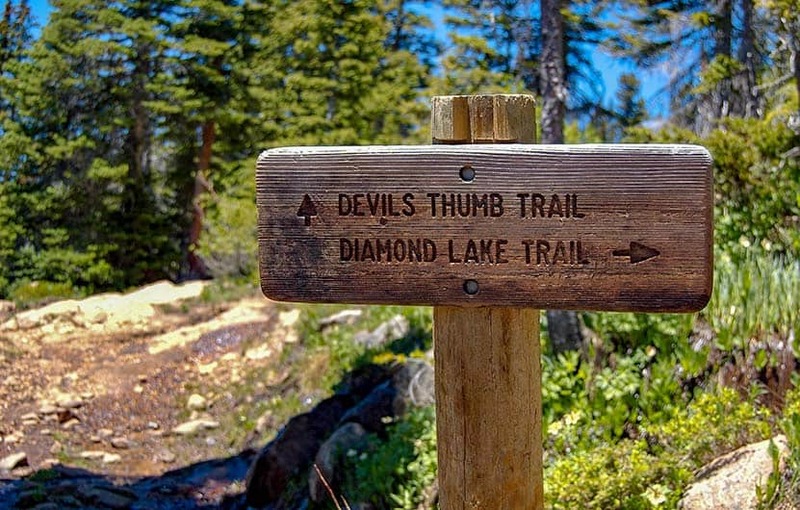 The right-hand Devils Thumb Bypass trail was created for Spring and Early Summer hikers because the main Devil’s Thumb segment can get thick with mud and drenched with water during the early snowmelt. Otherwise, the left-hand Devils Thumb Trail will be the most scenic. 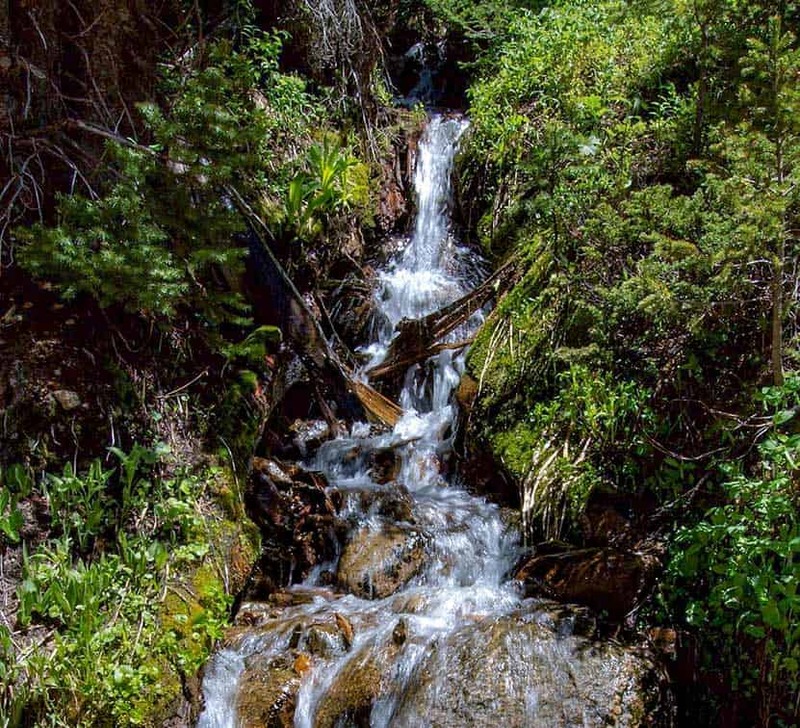 Small waterfalls and cascades are spotted along the trail as it makes its way along Middle Boulder creek. Indian Peaks is also famous for its wildflowers in the early and mid-summer. If you’ve taken the Devils Thumb (main trail) then you’ll encounter a second intersection with signage that points left to Lost Lake and King Lake, and right for Devils Thumb Lake, Jasper Lake, and Woodland Lake. 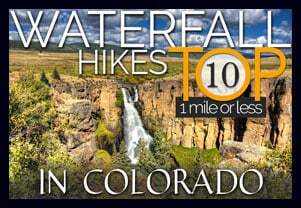 Taking the right-hand trail will lead up to Devils with more small waterfalls, cascades, and wildflowers. The next intersection will have a left-hand trail that leads to Woodland Lake and a right-bearing trail that leads to Devils Thumb and Jasper Lakes. This is where the bypass trail joins up to the main trail from the southeast. And here is where the terrain becomes much more steep and challenging. About 1/2 mile before the side-trail for Jasper Lake, a trail sign will point the way northeast to Diamond Lake. However, Diamond Lake is best accessed via the 4th of July Trailhead. Jasper Lake is every bit as beautiful as Devils Thumb Lake and is worth stopping to take in the views. However, be mindful of the weather, especially during the Summer months when afternoon thunderstorms can explode onto the scene without much warning. It’s just 1 mile from Jasper Lake up to Devils Thumb Lake. 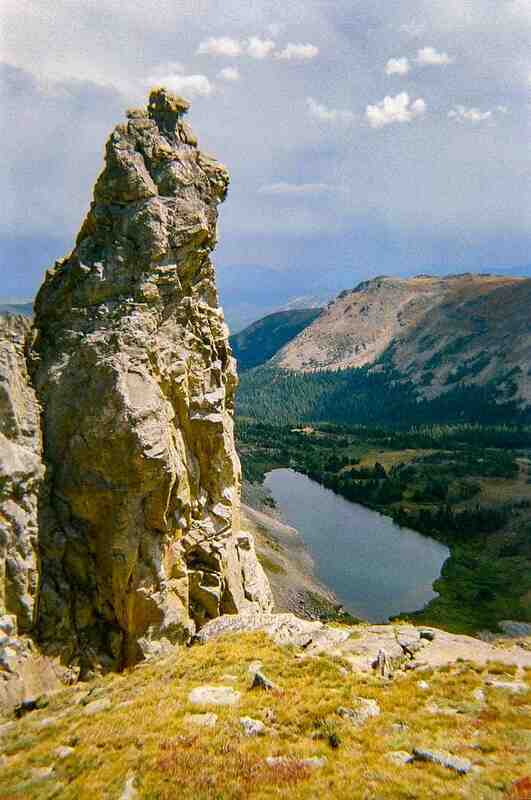 The lake is named after the tower of rock prominent upon the ridge above its waters. The Thumb can be seen from many miles away when driving Hwy 40 near Winter Park, Colorado. TIP: Parking is very limited at the trailhead, so try to arrive before 7am. Review trailhead information above for seasonal weekend and holiday shuttle from Nederland. CAMPING: Camping is allowed by permit only and in designated spots. See the Indian Peaks Alliance page for details. USFS Indian Peaks: Camping is allowed by permit only and in designated spots. See the Indian Peaks USFS Page page for details. TIP: The trail is rocky and steep so it would be a good idea to bring trekking poles. Photo: We would like to express our gratitude to Brendan Brombaci, The Bosleys, and Eric Frazier for sharing photographs of this hike on Devil’s Thumb Lake.